If you have an iPhone, Android phone, or tablet, you're familiar with the concept of apps (applications) that allow you access content, perform tasks, and do shopping. However, did you know that your TV or Blu-ray disc player often times have apps too? This is very common these days, and one great example of incorporating apps into a TV or Blu-ray Disc player is provided by Samsung via its SmartHub platform. 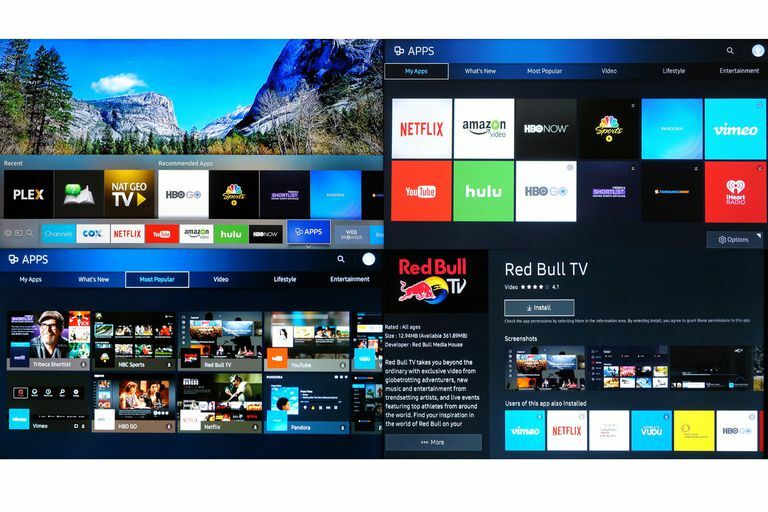 Samsung Apps take TV viewing to a whole new level by bringing useful and fun internet content (such as Netflix, Hulu, YouTube, Pandora, and more...), activities (shopping and games), and more, to your home theater viewing experience. The seven-article series listed below take you through the world of Samsung Apps to give you all the information you need to know, including how to use and manage the apps. Is your TV smart? Samsung has helped to change the way you interact with your TV (and Blu-ray disc player) by incorporating a feature known as Samsung Apps. The Samsung Smart TV concept is not only a networked TV that can access online movie content like YouTube and Netflix but also enhance your lifestyle. Find out what Samsung Apps are and how taking advantage of this feature available on some TVs and Blu-ray disc players, can both expand your home entertainment options, but also make your daily activities more fun and efficient. Many Samsung TVs and Blu-ray Disc players incorporate apps like you might find on smartphones and tablets. However, it might not be immediately evident how to find and use Samsung Apps on your new TV or Blu-ray disc player. Alas, there is no Samsung Apps button on the remote. However, using Samsung Apps is easy. Find out how to access the apps, set up an account, download and manage apps that can expand your home entertainment experience. Also, since the Samsung Apps platform has changed over the years, we also fill you on how to use older and current versions as well. There are hundreds of Samsung Apps available for users of Samsung Smart TVs and Blu-ray disc players. There are apps for shopping, travel, sports, health and fitness, and even fun games for the whole family. You can also find lifestyle, education and information apps for music, videos, weather, news and more. Find out more about the types of available apps and get the scoop about which apps are good and which apps you might not want. Samsung's Smart platform (Smart Hub) offers up an abundance of apps to choose from on your new Samsung Smart TV or Blu-ray Disc Player. However, just as with TV channels, there are undoubtedly some that you probably are more interested in than others. Check out some of the popular apps we find to be the most practical and fun. Samsung's Smart Hub platform has always been on the forefront in making Smart TVs easy to use, but with stiff competition from other systems, such as LG's WebOS, Vizio's SmartCast, Sony's Android TV, Roku TV, and others, the pressure is definitely on Samsung to keep up, let alone stay ahead. Check out how Samsung's partnership with Tizen makes accessing and managing Samsung Apps even easier. Apps aren't just for accessing streaming content from the internet, Samsung's AllShare builds on its Apps platform by allowing users to access still image, video, and audio content that may be stored on PCs, media servers, and other compatible devices that may be connected within your home network. Check out the details. Samsung apps are great for accessing online streaming content, and Samsung AllShare allows sharing of locally connected content from PC and Media Servers, but Samsung has elevated the Smart TV/App experience even further with the ability of select Samsung TVs to control and manage other devices located around the house, including lighting, blind, and selected household appliances. Check out all the details on Samsung's SmartThings platform.